Mass protests against Donald Trump in the US have revived many questions around building mass movements, their goals and whether they can be achieved, and what forces need to be mobilised. 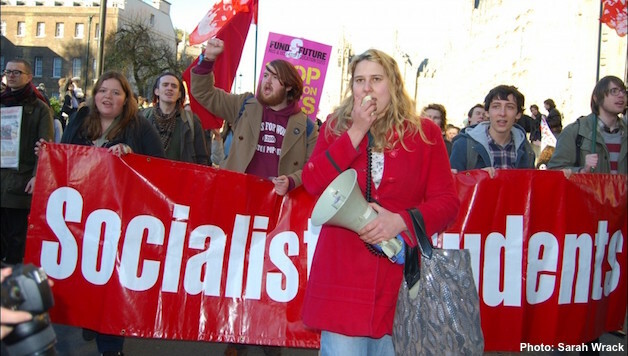 Recently, the left-wing magazine Jacobin published an article by Ellie Mae O’Hagan, one of the leaders of UK Uncut in 2010, that looked into the lessons of the British anti-austerity struggle for the anti-Trump movement. PAULA MITCHELL looks at O’Hagan’s arguments. Originally published in Socialism Today, Issue 208 (May 2017), the political journal of the Socialist Party (sister party of Socialist Alternative in England and Wales). In Spain and Greece massive demonstrations and general strikes took place. The National Shop Stewards Network (NSSN), in which the Socialist Party plays a leading role, lobbied the Trades Union Congress (TUC – Britain’s union federation) to call a national demo. But with the TUC dragging its feet, the NSSN and left-wing unions called regional demonstrations in October 2010. The government threatened to raise tuition fees and abolish the education maintenance allowance (a small but important subsidy to students from low-income families). In November, a National Union of Students demonstration brought 50,000 onto the streets, ending in an occupation of the Tories’ HQ in Millbank Tower. Youth Fight for Jobs and Education, supported by the Socialist Party, called for walkouts. In subsequent weeks there were walkouts by further education students and more demos, young people running through the streets of London playing cat and mouse with the police. University students occupied. In local areas, campaigns sprang up to defend libraries, nurseries and homes. Anti-cuts alliances were set up, mobilising local people in demonstrations against council cuts. The Socialist Party drew on the lessons of Liverpool city council in the 1980s and demanded that Labour councils should not pass on cuts. Hundreds of people protested and invaded council chambers calling on councillors to stand up to the Tories. Eventually, the TUC called a demo against austerity on 26 March 2011, and three quarters of a million workers filled London’s streets. The Socialist Party and NSSN called for the next step: a public-sector general strike. On 30 November, two million struck in a public-sector pension strike. Despite the capitulation of right-wing trade union leaders, left-wing unions and the NSSN pressed on, compelling the TUC in autumn 2012 to agree to ‘consider’ a general strike. Meanwhile, the Arab spring swept dictators from power in Tunisia and Egypt. Inspired by the occupation of Tahrir Square in Cairo, occupations of squares spread – to Wisconsin in the US, the ‘enraged’ in Greece, the ‘indignados’ in Spain, Occupy Wall Street and Occupy London. This movement raised the powerful idea of the 99% against the 1%. O’Hagan describes it as “an extraordinary and dazzling time to be an activist… It felt authentic and urgent – a movement infused with real vitality and power. In some ways, it was the best time of my life”. O’Hagan’s experience was primarily with UK Uncut and Occupy-type protest. UK Uncut involved hundreds of people in innovative protests, such as ‘big society bail-ins’ which encouraged people to occupy banks and transform them into something that would be damaged by cuts, like a library or a theatre. Hundreds of people visited the Occupy London tent city each day to show support for their protest against the banks. Unfortunately, however, O’Hagan seems unable to move beyond her own direct experience. Reading her article, it is as though struggle began with UK Uncut. Extraordinarily, there is no mention of other aspects of the movement taking place at the time. In particular, there is zero recognition of the massive trade union action. There was a deliberate view fostered by the leading figures in UK Uncut and Occupy that their ideas were new and better than the ‘old, traditional’ ideas of socialists and trade unions. This was encouraged by organisations like the Coalition of Resistance which advocated ‘new methods’ and ‘direct action’. The People’s Assembly, formed in 2013, never emphasised trade union action or called for a 24-hour general strike. John Rees, a former leading member of the Socialist Workers’ Party (SWP), argued at the PA conference in June 2013 that it was “ridiculous” for anyone to elevate any particular form of action: “We need all forms – demonstrations, direct actions, occupations, as well as strikes”. That idea was encouraged by some leading trade unionists. For some, this was deliberate. The likes of former TUC leader Sir Brendan Barber – knighted for holding back workers’ struggle – who, along with other trade union leaders, signed a letter to the Guardian saying “campaigns like UK Uncut… are critical both morally and practically”, had no intention of leading a fight and welcomed any opportunity to franchise out the struggle. The Socialist Party is no stranger to bold protest action. Indeed, we led the biggest civil disobedience movement in Britain when 18 million people refused to pay the poll tax. But we were clear that, while these forms of action are great at involving new layers of people, they would not be enough to end austerity. We explained in the Socialist in December 2010 that the student movement had made a tremendous start but, to defeat the enormity of the government’s attacks, it now needed the might of the working class to come alongside them. The working class, when it moves, can threaten the very heart of capitalism. Strike action can bring society to a halt. As Occupy gathered pace, we also pointed out that in the Egyptian revolution the tipping point came as workers went on strike, and the occupation moved away from just controlling squares and marched towards the seats of power. In contrast, O’Hagan mirrors the approach of UK Uncut and Occupy: the idea that a small band of protesters, if radical enough, can effect change themselves. It is understandable that many young people were not conscious of the role trade unions and strikes could play. Decades of ‘partnership’ with the bosses and the low level of strikes meant that many had never really seen workers in action. They had witnessed the potential power of the unions through 2011, but the capitulation at the end of the year reinforced the view put over by UK Uncut’s leaders. This is why a serious strategy has to include fighting to transform the trade unions, alongside explaining the central role that the organised working class can play. O’Hagan raises the question of demands and is right in saying that Occupy London, in particular, struggled with what it was campaigning for. In its newsletter, protesters declared: “I’m going to stay here as long as it exists; the thing is going to exist until we reach some change”. They famously began their tent protest with a big banner saying: ‘Capitalism IS Crisis’. Due to disagreement in the camp, however, that was replaced with: ‘Real Democracy Now’. O’Hagan’s conclusion is: “Perhaps discussing what success looks like involved admitting that we’re actually quite far away from a socialist utopia, so any achievable demands might end up being somewhat reformist and liberal. This reality is pretty depressing, so some people find it easier to avoid rather than wrestle with it”. This is an incorrect approach. What is achievable is decided by the struggle, not by an abstract assessment taken before you even begin. Fight for what is necessary. While immediate demands that can be achieved are very important, a movement can grow that can rapidly challenge the interests of capitalism. In fact, many young people involved in those struggles – as in the protests against Trump today – were searching for ideas and alternatives. The Occupy London newsletter said: “We know the system as it is cannot go on. We must seek alternatives and we must do so together as a people with a new emphasis on equality”. Yet most of those in prominent positions in UK Uncut and Occupy were actively hostile to socialists. It was understandable that there was hostility to political groups among a layer of young people who only had experience of the establishment parties. This mood was exploited by those ideologically opposed to socialism, and O’Hagan is not averse to this approach, having referred to “delusional Leninists” in the Guardian on 9 August 2016. Nonetheless, in her analysis of what went wrong, and in her advice for the anti-Trump movement, she inadvertently confirms many of the warnings made by the Socialist Party. The job of our party was not to carp from the side-lines. Our members got stuck in, participating in UK Uncut protests and supporting Occupy. While welcoming struggle, however, it is the duty of socialists to warn of any potential dangers in the methods employed, and to say what needs to be done. O’Hagan identifies a problem in the assumption that the movement would be a permanent fixture. She says that one of the reasons why the movement “deteriorated significantly” was that activists were demoralised by losses and burned out. There are ebbs and flows in any movement. For example, the editorial in the Socialist on 8 December 2010 recognised the likelihood that, due to the betrayal of the Lib Dems on tuition fees, many young people would be disappointed and may think that there was nothing more that could be done: “The first thing young people need to know is that this is not the end… The poll tax, for example, was not beaten in one rush; in fact it became law in 1988 and was defeated in 1991”. We stressed the need to get organised, learn lessons from previous struggles, and plan. Without this sense of perspective, without the ideas of what needed to be done, the demoralisation for those around O’Hagan was likely. O’Hagan raises another critical factor: “We underestimated the extent to which we would be crushed by state repression”. She describes the experience of being arrested as part of an occupation at a department store as “so chaotic and unnerving that many of those involved just wanted to forget that the whole thing had happened at all”. This confirms the argument made consistently by the Socialist Party of the importance of organising the defence of demonstrations and protests, particularly in relation to mass actions rather than individual stunts. At the time, the opposite was presented as a sign of how much better these protests were than the ‘old-style’. On 29 November 2010, the UK Uncut blog said about its protests: “Remember that no one will tell you what to do. There will be no officials in yellow bibs guiding you. You will make decisions for yourself”. In the winter of 2010, however, students faced brutal police kettles for hours on end. In the Socialist in December we gave concrete guidance: “The police are being used to intimidate young people from protesting… it demonstrates the importance of proper democratic organisation and stewarding. It is possible to avoid police traps with sufficient stewarding and planning – as was shown, for example, by the leadership of socialists in the face of police aggression at the G8 protests in Rostock in 2007… Again, trade unions can play a vital role, providing stewards for student demonstrations”. When it comes to the anti-Trump movement, O’Hagan is all at sea. An article on 27 December 2016 in the Guardian is illustrative of her rudderless approach: “In the chaotic aftermath of Brexit, several friends contacted me asking what they could do to make things better… The truth was I didn’t have any answers, and I felt just as hopeless and worried as they did”. She finds hope in a new campaign, Bridges not Walls – illusions in another self-appointed group of activists. This means that O’Hagan and her ilk have no confidence in a movement to win. She calls the hope that Trump could be impeached “wishful thinking”. She likens it to the hopes many had in the Lib Dems in 2010, hopes which were dashed when they entered the coalition government. But the Socialist Party had repeatedly warned about the risk of creating illusions in that capitalist party. In 2003, then Lib Dem leader Charles Kennedy spoke from the platform to the millions-strong anti-Iraq war demo in London – a decision pushed through the Stop the War committee by the SWP and its allies against the objections of Socialist Party representatives. This helped to build up the Lib Dems’ ‘radical’ image. O’Hagan asks: “Who would bring him down anyway?” She rejects the idea that either the Republicans or Democrats would do that because they are only interested in keeping power. Yet history tells us that presidents can be brought down (Richard Nixon through Watergate), as can ‘iron ladies’ (Margaret Thatcher by the anti-poll tax movement). The representatives of capitalism will act to remove politicians if the threat from an angry and organised working class is too great. That is precisely the part she does not see: the possibility of a mass movement that threatens the ruling class. Who is Ellie Mae O’Hagan to decide in advance that it is not possible to bring down Trump? That will be decided by a mass movement and the balance of forces. But, O’Hagan reasons, even if he was removed he would only be replaced with another right-wing politician. Although she does not say so explicitly, this is a reference to the argument of some on the left about Britain after the Brexit vote. During the EU referendum the Socialist Party said the working class could use it to beat the Tories, and not only could David Cameron be compelled to resign but, if that mood was organised and directed, the Tories could be forced out. We were proved correct, and Cameron, George Osborne, Michael Gove and Nigel Farage all fell from grace like dominos. With Theresa May as prime minister, O’Hagan has tweeted that “now would be a great time for an update on how Lexit is going”, essentially saying that keeping Cameron would have been better. This is ‘lesser evilism’ gone mad, a position shared by those around Owen Jones and the Stop Trump campaign. The point is that the anger was not organised. A left exit campaign, had it been led by Jeremy Corbyn and the left-wing trade union leaders, could have harnessed that anger into a mass anti-austerity alternative to the big business EU and the Tories, instead of the RMT, Aslef and Bakers’ unions, the Socialist Party and the Trade Unionist and Socialist Coalition (TUSC) being left alone to argue the case. The Tories could have fallen and Corbyn would have been in a powerful position to finish off the Blairites within the Labour Party and win a general election. In the US, this means that a vital task is to fight for a new party of the 99%. Although O’Hagan does suggest that activists should be trained up to stand in elections – “The left should always be looking to take power so it can bring about profound social change and make sure that change is permanent” – there is no sense that this is a task posed now for the anti-Trump movement. She makes no reference to Bernie Sanders’ campaign, or to the debate currently occupying other pages of the Jacobin magazine: whether to try to change the Democrats or build a new party. In fact, she merely says that candidates could stand for the Democrats or be ‘independents’. The Socialist Party’s co-thinkers in the US (Socialist Alternative) campaigned for Sanders to run all the way in the presidential campaign. They argue now for a break with the Democrats and for the launch of a new mass party to offer the kind of combative, working-class-based leadership that will be needed to confront Trump. In Britain, the Socialist Party has fought vigorously for the steps needed to transform the Labour Party into a socialist anti-austerity party under Jeremy Corbyn, while maintaining our involvement in TUSC to stand anti-austerity candidates against cutting pro-capitalist Blairites. O’Hagan rightly says that, once “leftist activists” get elected, “they should be reminded every single day of the movement that put them there, and that they better make damn sure they don’t betray its principles”. This again poses the crucial question of the party and of democratic control and accountability. Without Ellie Mae O’Hagan realising it, this raises the need for a socialist programme. If a Corbyn-led Labour government was elected on an anti-austerity programme, it would come up against the interests of capitalism immediately. The same would be posed in the US. The capitulation of Syriza in Greece is a stark warning. A socialist government needs to be prepared to go all the way and take socialist measures, to nationalise the banks and main planks of the economy, backed up by a mass movement.